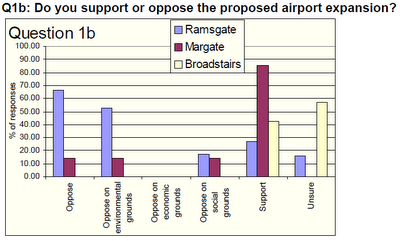 “Brazier supports Kent International Airport” according to the politics.co.uk website. (Just as an aside, if I had grown up being teased for having a surname that sounds a bit like brassière, I would forbid the use of ‘support’ in the same sentence as my name. But I digress.) Julian Brazier is the Conservative MP for Canterbury and shadow minister for Transport – do check out this link to the excellent TheyWorkForYou website. In his submission to the Transport Committee’s review of the future of aviation in the UK, Julian wrote that “KIA has the benefit of strong local support for expansion. This local support expends [sic] to the Local Authority (Thanet District Council), the County Council (Kent County Council).” What makes him think that? When the locals were asked in 2008, what was the result? Well, Thanet District Council would have us believe that opposition had transformed into support. Others aren’t so sure. A related matter concerns the reference by the Leader of the Council to MORI poll data on public attitudes to the airport. Would you please arrange for us to be supplied with the full MORI report and background data to which he referred. I should mention that having been a consultant to the Market Research Society in the past I know that they have strict rules about the way in which such information is released and subsequently used, to avoid selective “cherry picking” of market research. As I have explained earlier, the much-trumpeted new jobs that are supposed to accompany airport expansion and seem to have bedazzled both Local and County Councillors are in fact tiny fractions of virtual jobs scattered the length and breadth of Britain. When this awful realisation sinks in, the Councillors need to find some other justification for supporting the airport expansion. It would be tactless to say it’s just exciting for them to be involved in a big project. They need to be able to point to real benefits for their voters, benefits that outweigh the noise, pollution, congestion and risk. The proposed expansion of Manston (quite apart from being a bad mistake on a number of counts) offers the people of East Kent pain without gain. Previous Manston keeps failing. What next?